Inspired by the legendary CymaScope instrument. See the actual geometry of music for the first time. 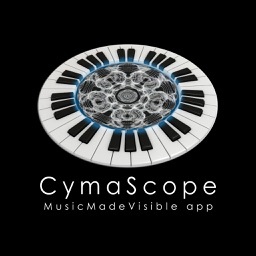 * The CyamScope App is the world's first App that allows you to see the geometry of piano sounds. 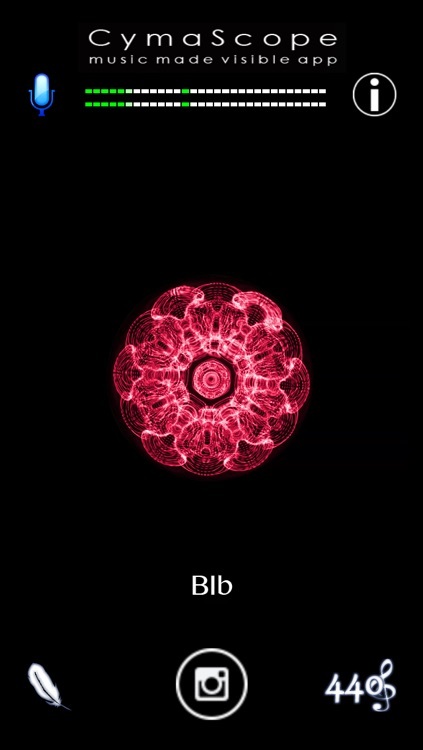 * The beautiful cymatic imagery you see is not computer generated. 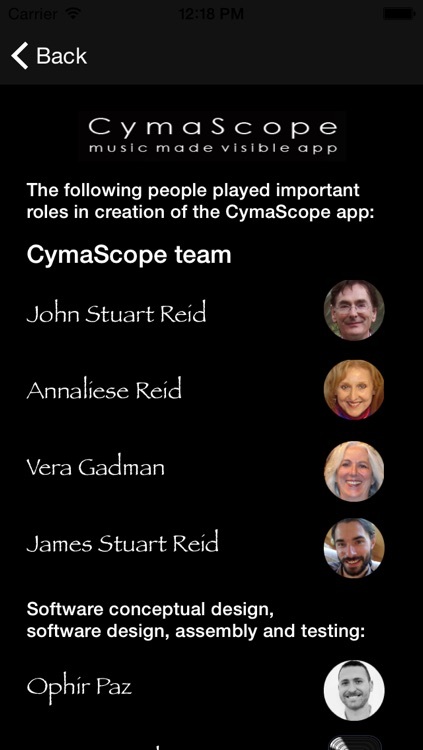 * All imagery in the app was created on the CymaScope, (a scientific instrument that makes sound visible) and then stored in digital memory for you to enjoy. 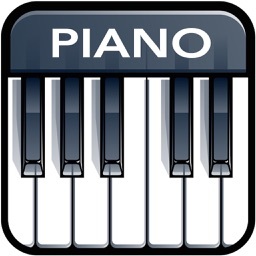 * Play the Keyboard - Play the piano using touch-sensitive circular keyboard in your choice of concert pitch. 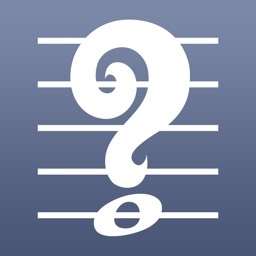 * Use your voice - Trigger the notes with your voice - great fun and can be used for voice coaching. * Live Music - Play a live musical instrument or any recorded music to the app and watch the CymaScope imagery unfold in real time. 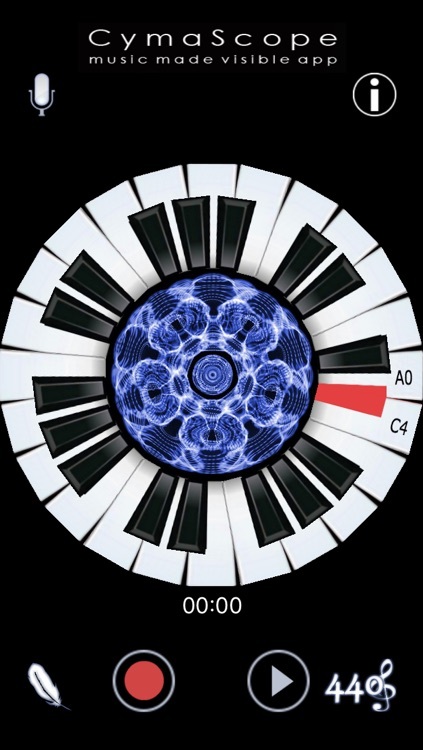 * Record a melody line of up to 144 notes to be played and replayed at the touch of a button, revealing the beautiful cymatic imagery in real time. 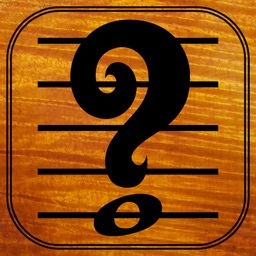 * Concert Pitch - Select your favorite concert pitch: 432 Hertz, 440 Hertz, 444 Hertz, each providing unique dynamic imagery. 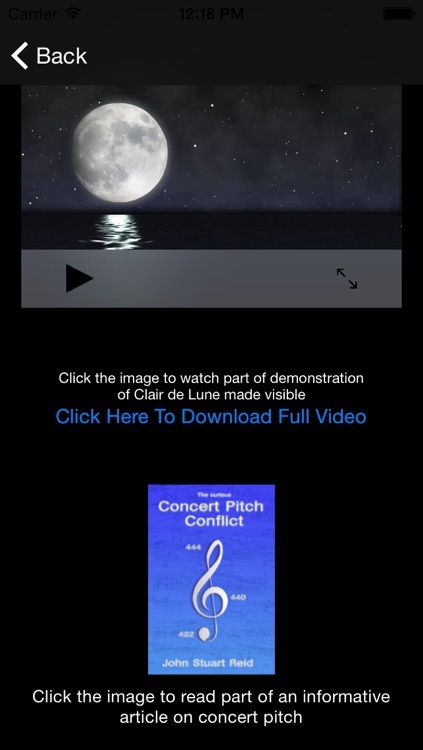 * Project The Imagery - Experiment with visual projection of the piano notes by connecting a video projector to the iPhone or iPad. 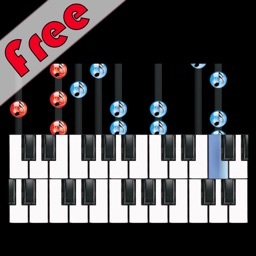 * Color Or Monochrome - Choose the 440 Hertz visible piano notes for colorized performance, or choose the 432 Hertz and 444 Hertz visible piano notes for monochrome study. * Capture & Share - Capture moments of the imagery and share on Facebook or by email. * Save and print - Save any moment of the imagery to the device's Photo Library then print a hard copy-great for colorization by children using paints or crayons. 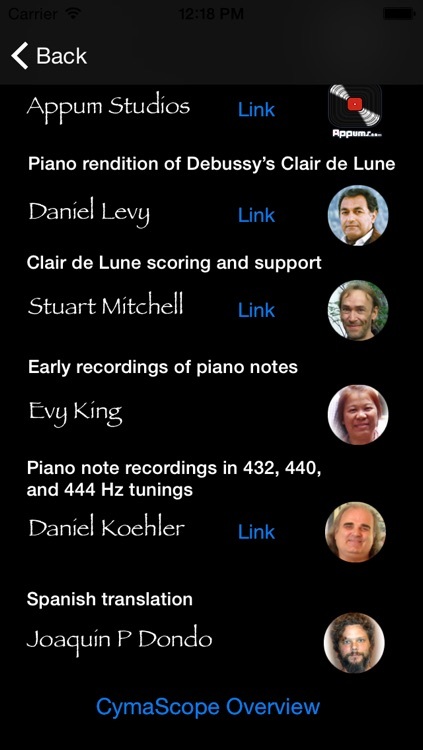 Watch a demonstration of MusicMadeVisible of Debussy's Clair de Lune in 440 Hertz tuning played by concert pianist Daniel Levy. 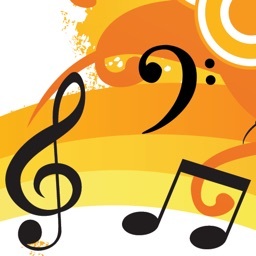 For those interested in the subject of concert pitch, an article on this subject is included in English, Spanish and German.